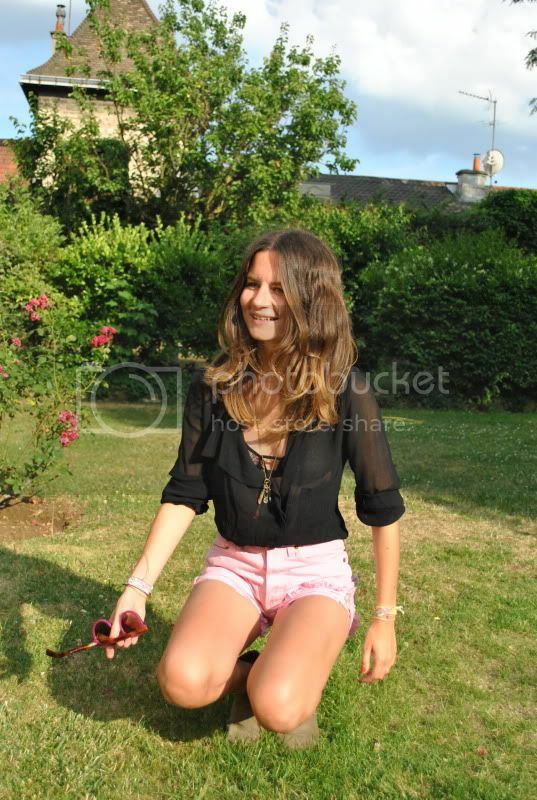 short Levi's vintage teint en rose, chemise vanessa Bruno, boots & necklace isabel marant. J´adore les shorts et les lunnettes!!!! i like it so mouch! Nice! where did you find these shorts? this outfit is very chic yet completely laid back. i love it. you look great and what great legs you have. LOVE those pink shorts!! The sheer top is beautiful too. Gorgeous look! LOVE the blouse and the jacket !!! and ADORE the pink shorts !!!! Hope you check mine out and follow me too !!! coucou! A quelle endroit as tu acheté ton maillot IM qu'on voit sur le post précédent ? The pink is the perfect pop of color! So cute. Tu es trop jolie! j'adore les photos 7 et 8! Hi Marta, this is probably one of my favourite outfits. Really like the pink+black. You have a gold ring, did you get married? If so, CONGRATULATIONS!! So fresh and sweet ! A weird question comes to my mind : do you always wear those ribbon as bracelets ?? Have a nice day and may whoever God listen to your prayer and let us have a summer time ! I love your blouse with the bra showing a bit! maillot IM du post précedent acheté l annee derniere chez IM. you're just a little bit cute. lovely! the shorts are great, have to get pink ones, too! c'est roseanna de l annee derniere mais ils font svt les memes formes je pense! Martuś gratulacje ze tak masz dużo ciuchów Isabel Marant, moja ulubiona projektantka. Uwielbiam te zamszowe botki. je voudrais vraiment savoir d'ou vienne tes lunettes, j'ai pu comprendre d'un magasin a coté de bastille mais lequel ? ton blog est fantastique ! Does anyone know what the heel height of the isabel marant forbes boots are? I just ordered a copycat version from asos but they look like they've got a bigger heel which I'm not sure i like as much!